Rebuilding small car trailers - new suspension. 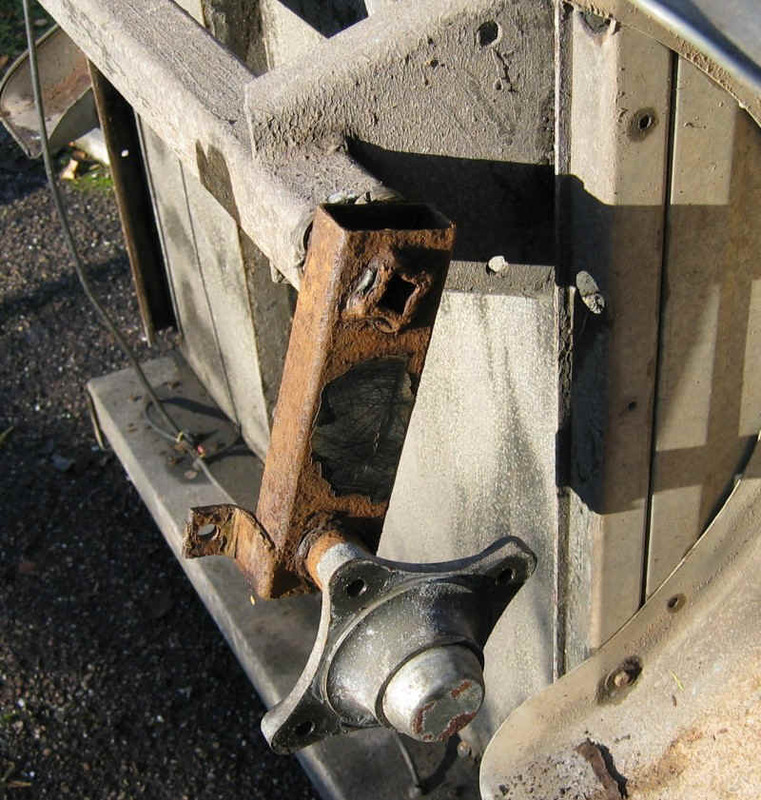 Unroadworthy car trailers: photos of mending a typical example of corrosion and suspension failure. 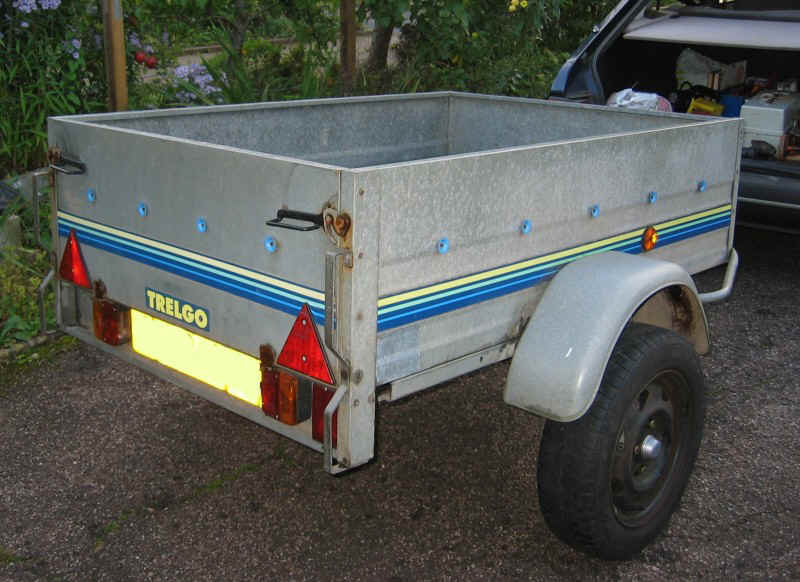 MoT testing of trailers in the UK and trailer repair. In the last few years (to 2012) there have been several suggestions that small car trailers should be subject to regular MoT type tests. 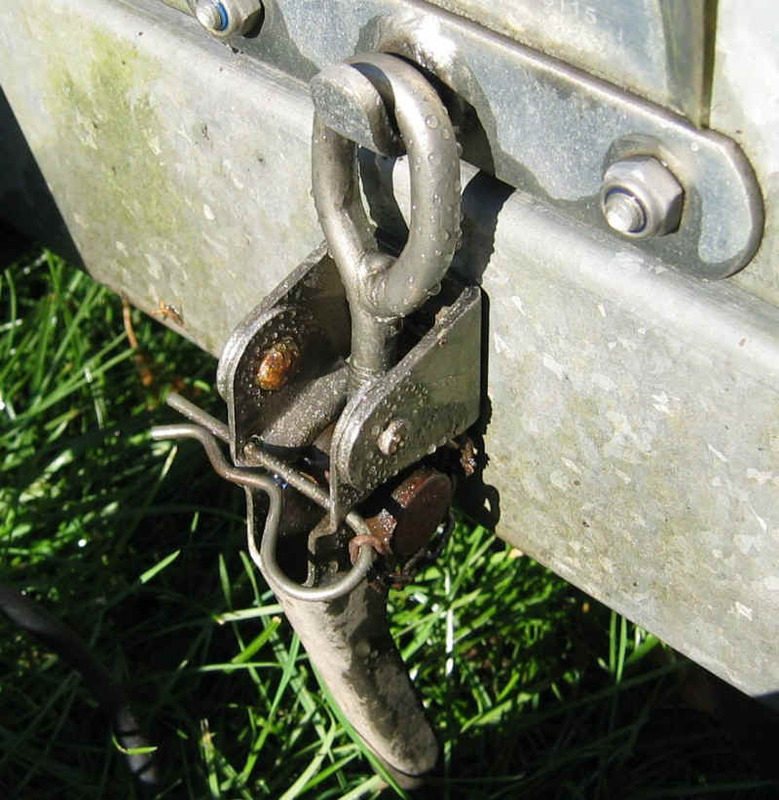 Complete collapse of trailers whilst being towed is not unknown, and wheels quite regularly come off because major suspension components have failed owing to corrosion. However, current proposals are only for new trailers to meet EU directive EC 2007/46. This is for type approval requirements and does not impact on poor design or specification of components that may lead to early corrosion and failure. 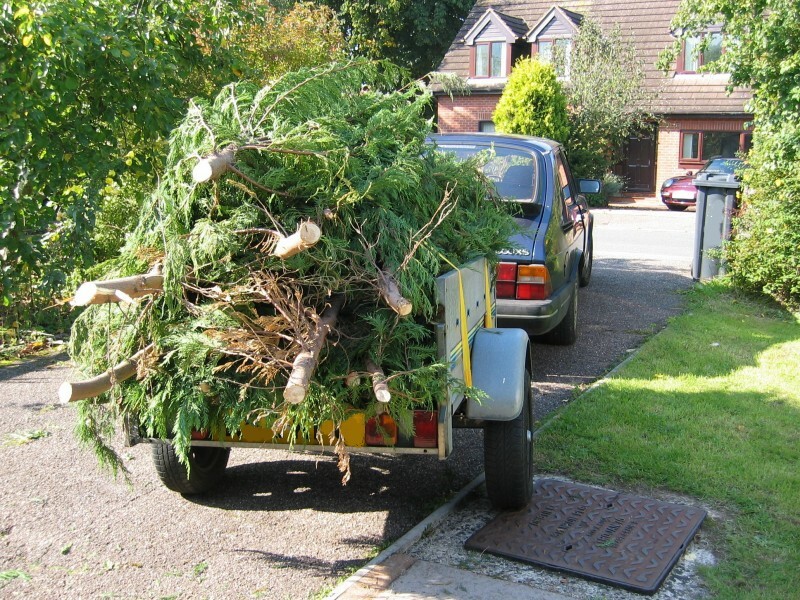 As of 2012, the UK Dept of Transport said it had no plans for regular testing of small trailers. In contrast, arguably absurd aspects of some parts of the MoT test for cars is leading to an increasing number of perfectly safe older cars being scrapped unnecessarily. Since the vast majority of accidents are caused by driver error and inattention, it is arguable that MoT testing of cars should be restricted to a sensible and not over-rigorous examination only of major safety related components. This would remove or dilute many of the current requirements - which have become a licence to print money for garages. The Royal Society for the Prevention of Accidents (RoSPA) was quoted in the Daily Telegraph of 24 March 2012 as saying that failure of car trailers "was not an issue they had looked at" and "it doesn't stand out in road accident figures". This is simply because there are so few trailers on UK roads compared with the number of cars, and the annual mileage is also low. Trailers are used typically for short local journeys. However the specific risk from trailers that are not roadworthy and/or that are overloaded is extremely high. It is a similar situation with caravans and motor homes. 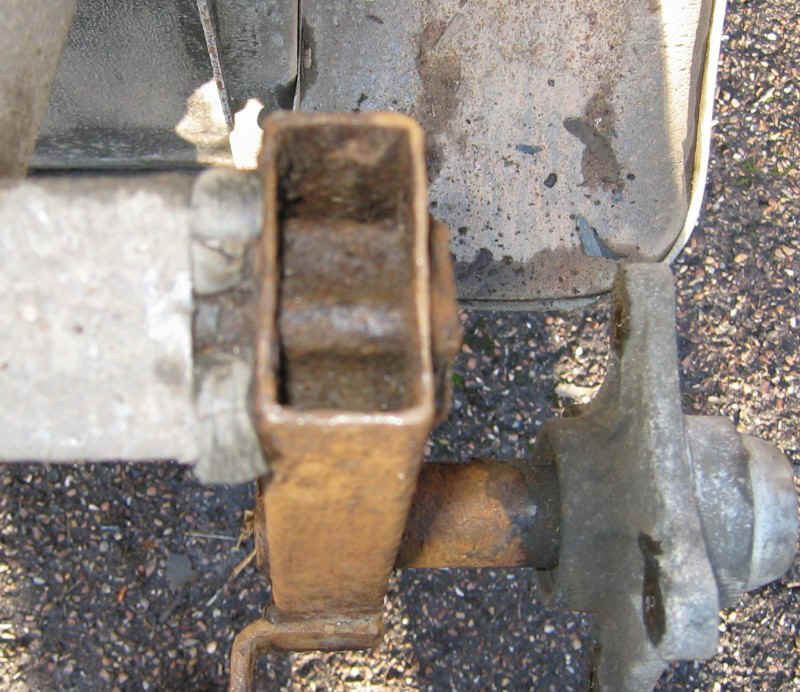 Many older caravans have inoperative or badly maintained braking systems (one example of a repair is given here) and the basic design of even very expensive motor homes is often undertaken with no testing of their performance in a crash - simply because there is no legal requirement to do so. Cupboards, cookers and refrigerators (etc) can come adrift and fly forwards! Again, because of the small numbers of motor homes on the roads, the numbers of serious accidents is very low yet the specific risks in driving such a vehicle can be high. 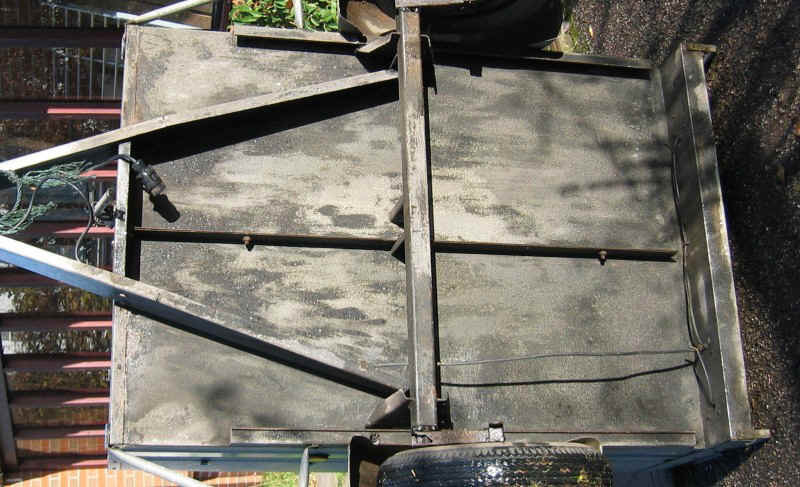 This webpage describes the typical pattern of corrosion failure of a small car trailer. It is shown how a specific model of trailer can be rebuilt for about �0 using high quality parts of 'UK' specification. Similar procedures can be followed with many types of small unbraked trailer that utilise rubber bonded suspension. Trailers that were originally designed with either leaf spring or coil spring suspension can also be converted to use rubber suspension, but such conversions are rare because both coil spring and leaf spring suspensions are generally very reliable and long lasting. Failure of hollow box-section suspension drop arms. 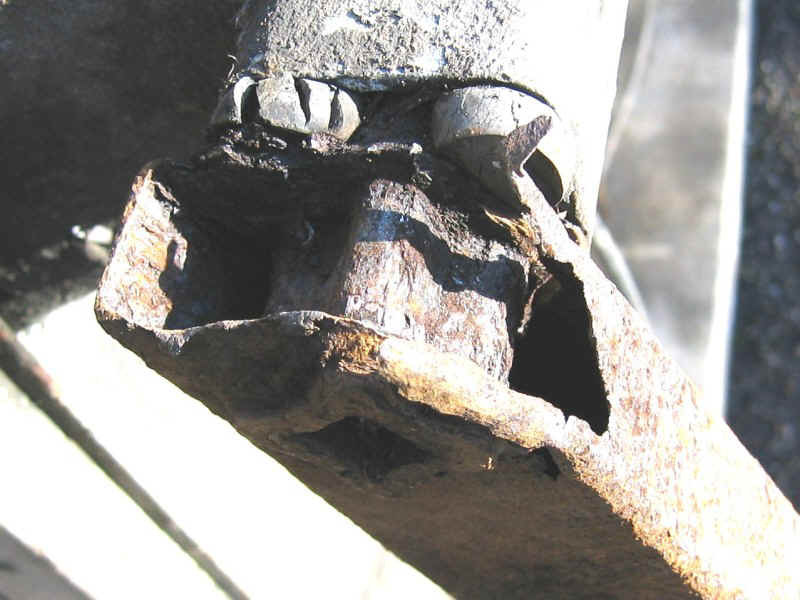 Suspension corrosion is a common problem with small trailers using hollow box section drop arms. The other problem with 'continental' designs (which are very widely sold via UK outlets) is that none of the suspension components or wheels are interchangeable with standard UK patterns, so spares are more expensive. 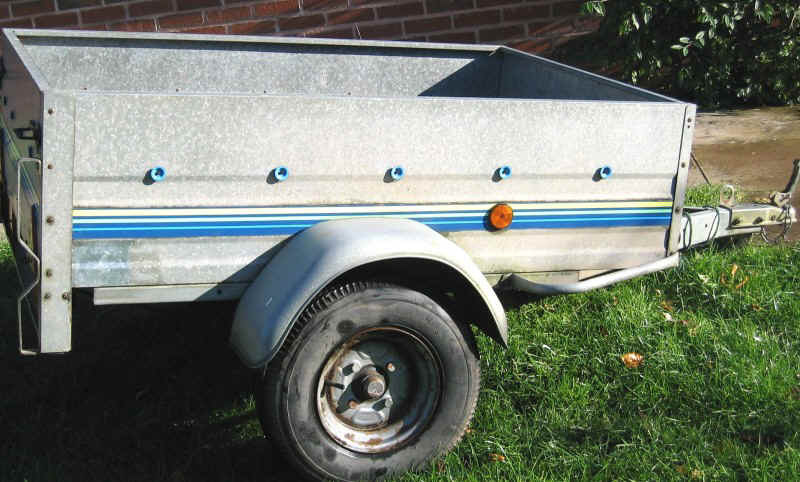 The unroadworthy nature of many small trailers of this type has led to calls for all trailers to be 'plated' and subject to annual MoT type testing, as is required in Germany and Sweden for example. 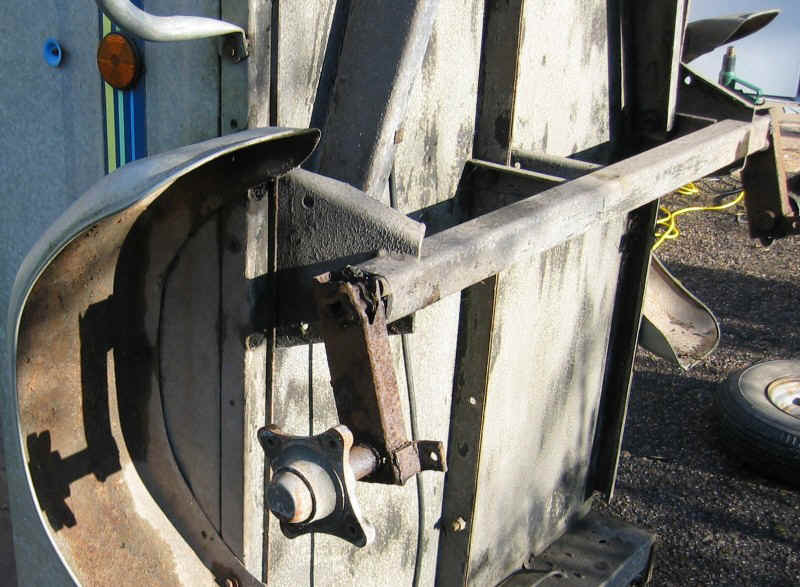 However, the principal dangers from trailers on UK roads probably arises not only from corrosion of commercially built small trailers but from the plethora of 'DIY' trailers where the welding and/or basic design is wholly inadequate. Other sources of risk are badly maintained and severely degraded caravans and old (and often corroded) caravan chassis frames being loaded well beyond their safe limits after having been converted (again on a DIY basis) into car-transporter trailers. Another problem is that much of the MIG welding undertaken at small workshops and in garages is undertaken using carbon dioxide as a shielding gas, instead of the more expensive argon/carbon dioxide mixture. Welds in mild steel produced using pure carbon dioxide as a shielding gas may not be to a high standard. This trailer was given to me because it was going to be scrapped owing to corroded suspension. It is a Trelgo type T50T (T50 tipping) with fixed sides and a drop down rear. 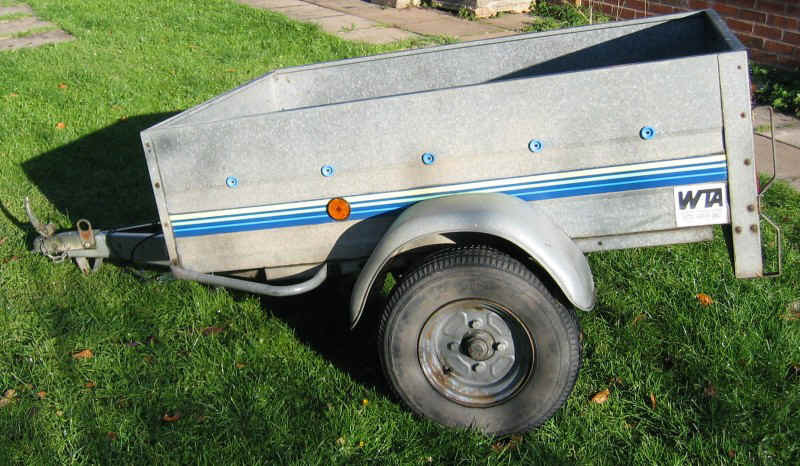 Features of this type of trailer include that it can easily be tipped onto its end by one person and then stored on its end without damage to the rear lights. 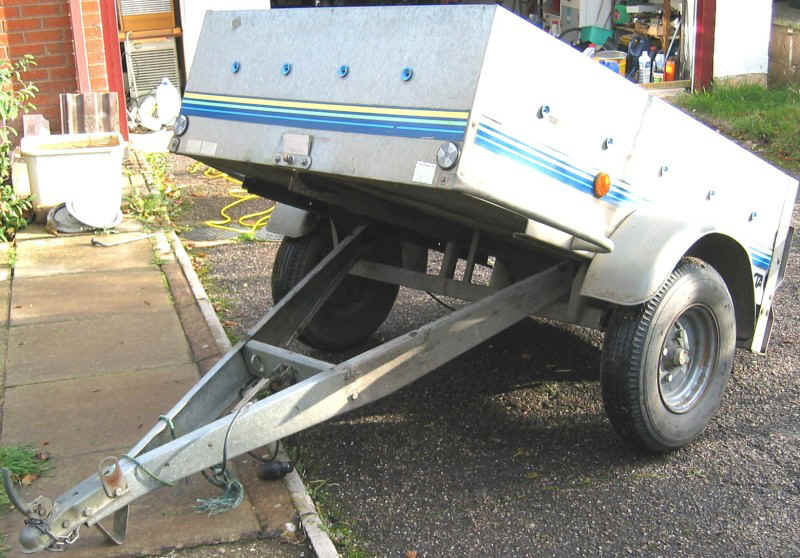 Trailers of this general design can last for 10 or more years even if stored out of doors - the sides, base and all suspension steelwork is galvanised - except for the most highly stressed parts of the suspension units themselves. 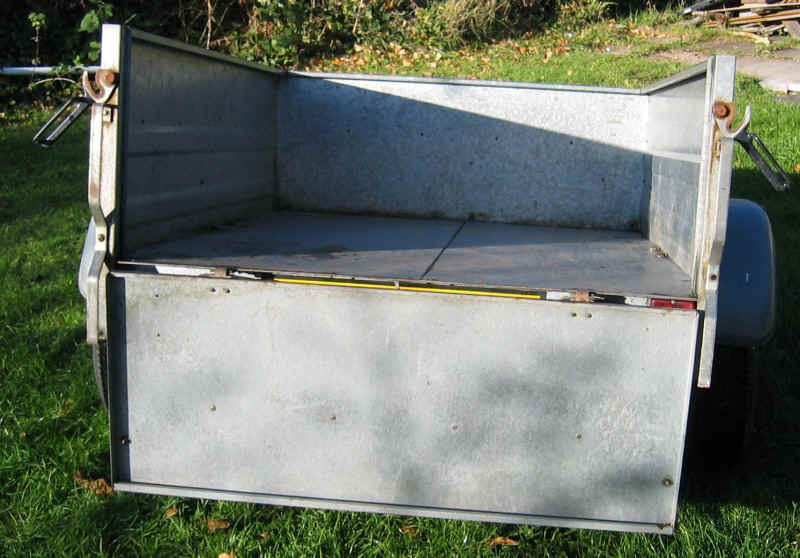 This trailer has a load area of 1500 by 1050 by 400 mm - it is at the upper end of the sizes sold (typically) by B&Q, Halfords and other outlets for 'garden rubbish' and other domestic uses. Almost universally, these 'superstore' outlets seem to sell only imported trailers. The best known UK manufacturer is Indespension. They sell a wide range of spares, including many suspension units with hollow box section arms. The galvanised bodywork is almost as new both sides even after 13 years being stored out of doors. It was purchased in 1998 for �9 from Western Towing and Alarms of Exeter - and in those days �9 was a lot of money! Like many consumer goods, trailers are now less expensive in real terms owing to far greater numbers being produced. The original 10" wheels had continental standard 115mm PCD stud spacing - these are not compatible with any UK pattern replacements. New wheels of 115mm PCD are more expensive than wheels produced to the UK 4" PCD standard. Some caravan wheels are 100mm PCD - very close to 4" but not the same. There are so many incompatible components in the caravan and trailer industry that things can appear quite confusing! Unlike many 'home built' small trailers, this commercially produced model has a deep A frame construction. Despite this, it is only rated at 500 kg gross. 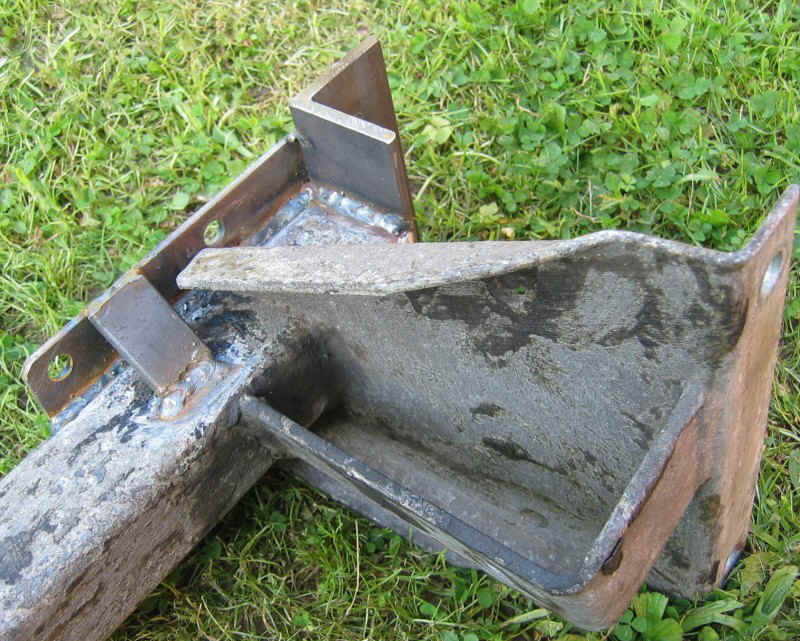 Many 'DIY' trailers are constructed from old 'angle iron' bedsteads and similar material! The tow hitch is rated at 800kg, with a maximum nose weight of 80 kg. A 500kg trailer of this general type (where 500kg is the gross weight) can run on a wide variety of wheel and tyre combinations. These are the 'standard' factory fitted options covering a range of trailer sizes. Low profile tyres are generally not used on trailers because the hard rubber-based suspension requires as much cushioning from the tyres as possible. In the conversion shown on this webpage, 155/70 x 13" Ford Fiesta wheels and tyres were used in place of the original 500 by 10" size. Use of 70 series tyres helped to reduce the overall rolling diameter - a valuable feature because the suspension modifications would otherwise have resulted in an unwelcome increase in ride height. Modern cars often use very low profile tyres - and although these give superior roadholding on smooth roads, they are a disaster on rough and pot-holed roads. Low profile tyres are more expensive and more easily damaged. Wheel rims are also more likely to be damaged if fitted with low profile tyres because they will be closer to the road. The usual tipper release catch with safety pin to prevent accidental release of the catch. This is located at the front of the trailer. Drop down rear - the rear panel can be lifted off many small trailers. This makes them adaptable to a wider range of uses. The underbody is galvanised and covered in some sort of factory applied undersealing compound. 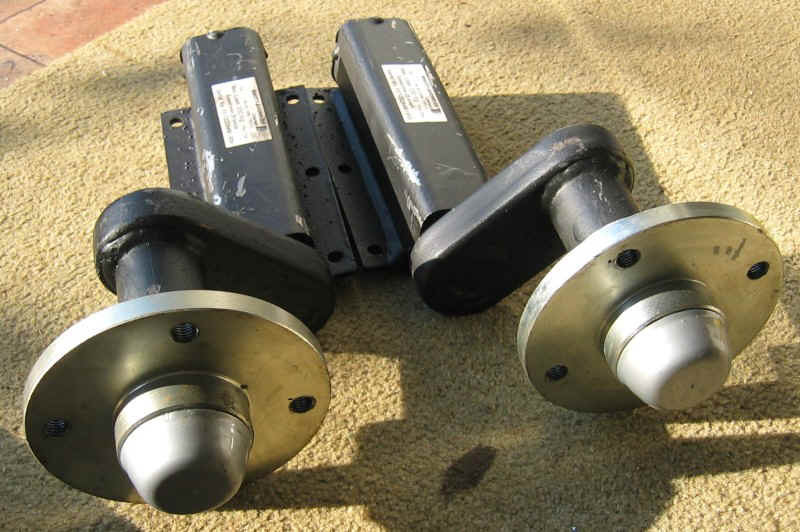 The A frame towing bracket releases by undoing 2 large pivot bolts. The whole axle assembly can then be unbolted. All you need is a socket set and 5 minutes work. This photo is rotated by 90 degrees - the trailer is standing on its end on a driveway. 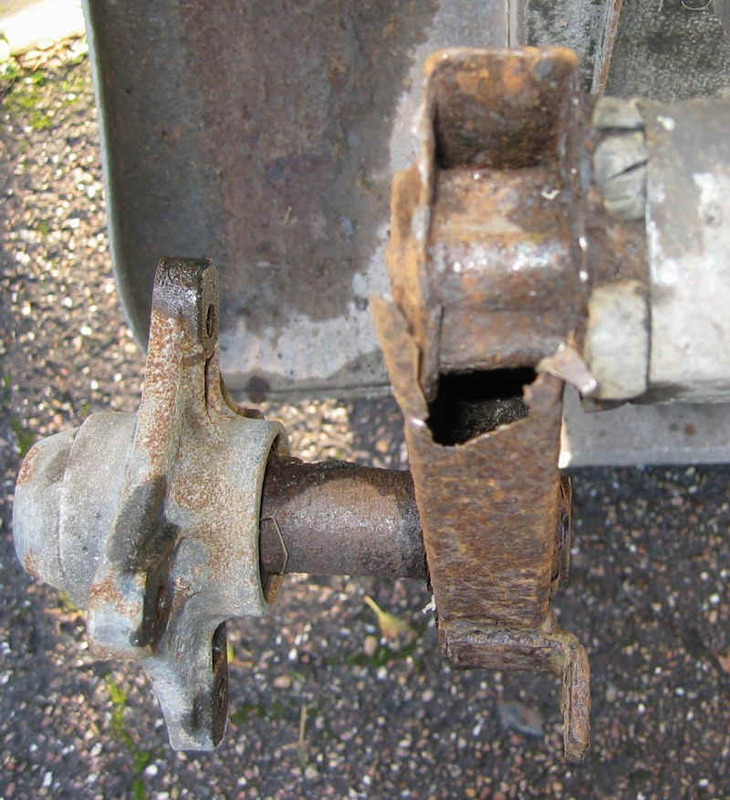 The offside suspension arm has been severely affected by corrosion. This damage is far too extensive to be repaired safely by welding. Indeed no repairs can safely be undertaken in this area, simply because access cannot be obtained to clean up and weld affected areas to a satisfactory standard. This area of the suspension is where the stress is highest. The original welding has to be very strong and around both sides of the drop arms. This is done before the units are pressed into the axle. The nearside suspension unit - they should both look like this. The photo is slightly out of focus - but you get the general idea. It is impossible to remove these rubber bonded suspension units by pulling them out of the axle. The only DIY removal method is to use an angle grinder to cut off the drop arms followed by drilling out the rubber at each corner - easier said than done because you need drills about 450mm long! Removing these heavy formed steel tubes and the rubber suspension from the axle took about 6 hours! Some people apparently heat the axle with an oxy-acetylene torch to burn out the rubber. This not only creates a mass of noxious smoke, it vapourises the galvanising (and again it is dangerous to breathe this). It is best to use only mechanical means to separate the component parts of the original axle. Leaving these steel tubes in place and simply cutting them off flush with the ends of the axle would add only 3kg to the unladen mass of the trailer. However, the rubber would have been burnt by the heat of welding the new suspension plates onto the axle. The offside drop arm is already twisted in relation to the axle and bodywork. The trailer towed empty on the road without any outward sign of a problem. However, the offside wheel splayed outwards under any appreciable load. 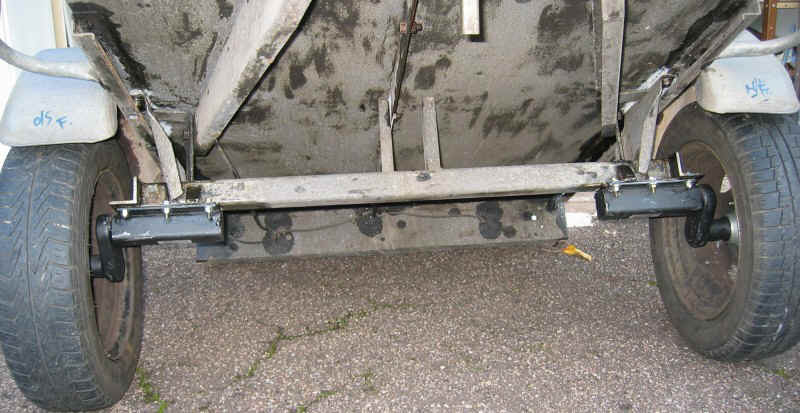 Obviously a trailer in this condition is unroadworthy because the wheel and hub assembly could become detached as repeated movement of the weakened metal induced further distortion, fatigue and cracking. 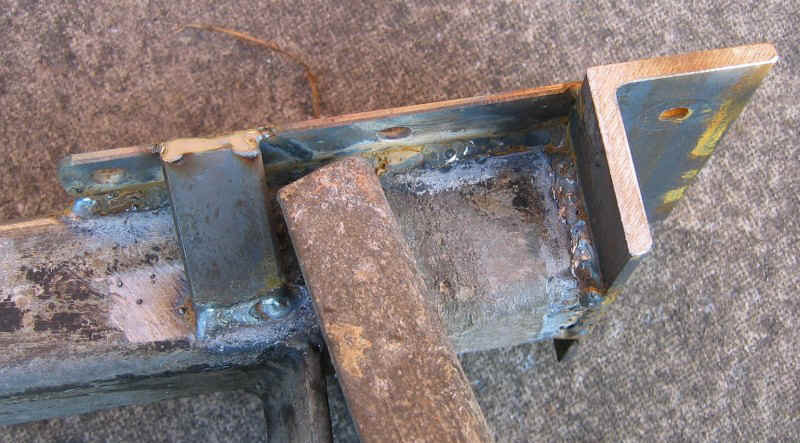 This type of corrosion is very common on small trailers sold on ebay and elsewhere because a wide range of commercially produced small trailers use ungalvanised hollow section drop arms. This is a serious design weakness. 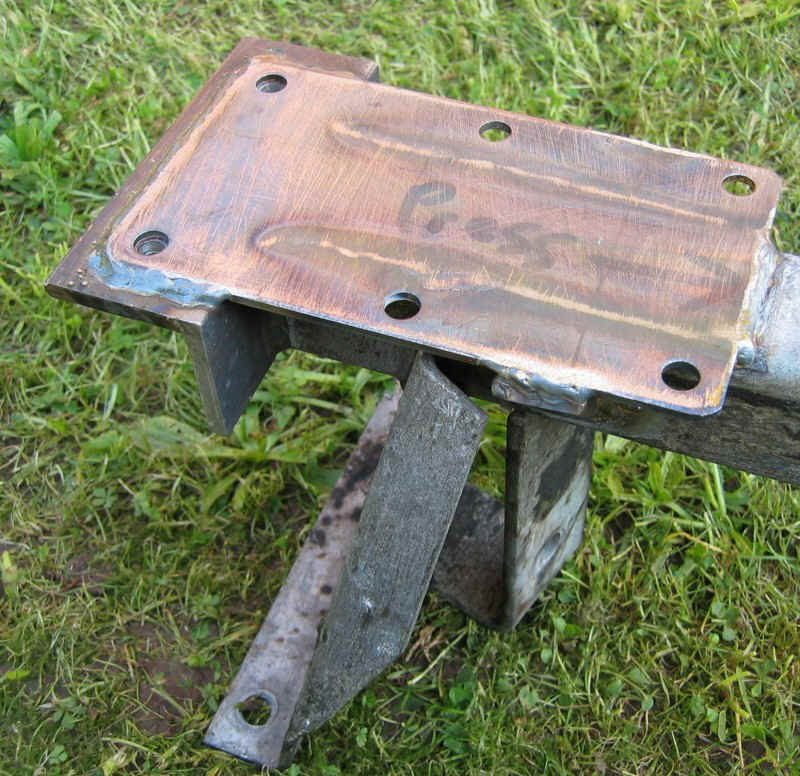 It is impossible to weld corroded units back to an acceptable strength, although no doubt, people do try. The whole axle beam assembly unbolts very easily from the body of the trailer. New mounting plates can be welded to the underside of the axle and replacement wheels and tyres fitted. The ride height is generally increased because new suspension units are welded to the underside of the existing axle. However, the drop arms on the replacement Avonride units were shorter - which reduced the height gain whilst moving the centre of the wheels forwards. Careful measurement is needed to ensure that the new mounting plates are welded in the correct position so that the new tyres clear the chassis and mudguards. 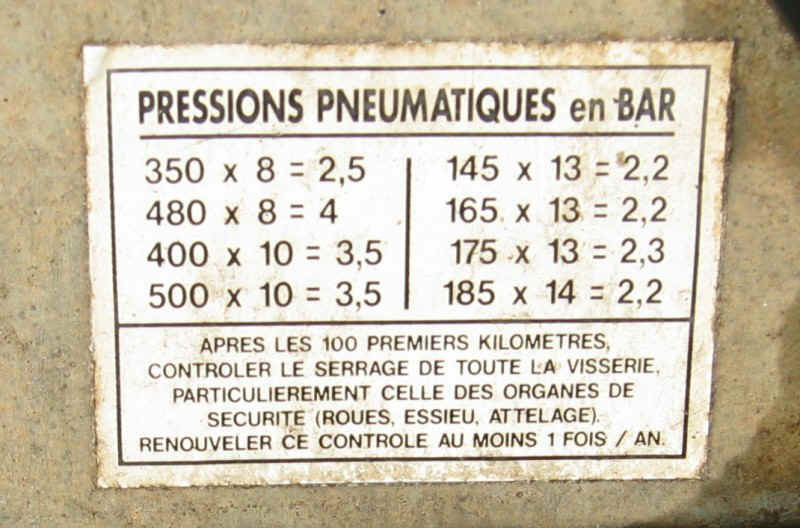 A good guide is to measure the clearances with the standard wheels and tyres: typically there should be 40 to 50 mm clearance between the side of the trailer and the sidewall of the tyre. This helps ensure that stones cannot be trapped between the sidewall and the trailer body: setting the new wheels too close to the body could result in the sidewall of a tyre being shredded by a stone thrown up from the road. The sound suspension unit (nearside). A complete new axle assembly costs around �0 (retail price) which is hardly worth it given that a new trailer of this type costs around �0 (discounted 2012 price). Also, the new axle would suit only continental type 115mm PCD wheels and hubs - and the old 10" wheels were badly corroded anyway. It is not possible to fit UK pattern hubs to a continental pattern axle - the bearing sizes are different. Given the high cost of new 115mm PCD wheels and tyres (about � each) it is more economic to convert the trailer to a UK specification using UK pattern suspension hubs and either new UK wheels and tyres or old car wheels. The stupid aspect of the whole design is that every component of these trailers could last for 30 or 50 years - except for the heavily stressed and crucially important drop arms which are not hot dip galvanised. Maybe the manufacturers want their products to be scrapped after ten years - so you are forced to buy a new one?! In all, it is an example of appalling design. There is a built-in guaranteed mode of failure - unless of course the trailer is kept in a warm dry garage and its vulnerable suspension arms are coated in grease. The consequences of this bad design include many inadequately repaired, dangerous and often overloaded trailers being used on UK roads. 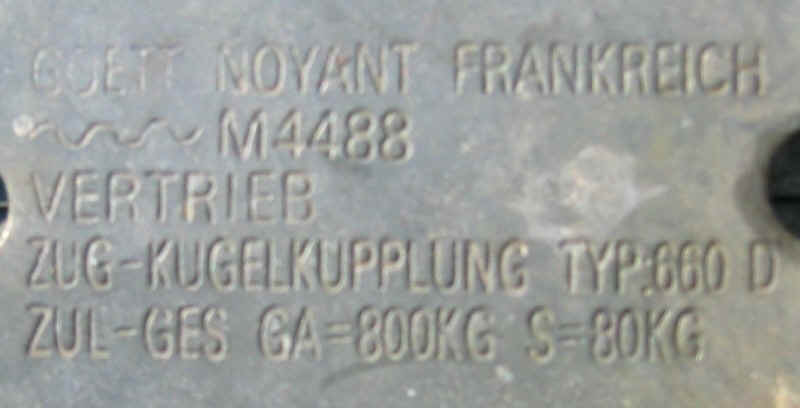 This trailer is almost identical to the modern FRANC GT151 unit. In 2011 some companies were still selling the Trelgo T50 but they were old stock - they have since been rebadged FRANC. You'd normally only use the tipping mechanism with a trailer coupled up to a vehicle, for safety reasons. Advert from Bridgewater Trailers for a very similar unit December 2010.
advert December 2010 from Acorn trailers showing spec of the Trelgo T50. Many replacement rubber bonded suspension units are available - those shown here are made by Knott Avonride. They are generally thought to be one of the best makes on the UK market. Most units accept standard 4 inch PCD trailer wheels which have a small or zero offset. These have the less common extended stub axles with 108mm PCD hubs to suit Ford Fiesta and some Peugeot wheels. One advantage of using old car wheels obtained from scrapyards is that they are often much cheaper than trailer wheels, and the tyres can have a higher load rating. The length of the (solid) drop arms is less than the original hollow box arms - which has the effect of reducing the ride height. This compensates neatly for the larger tyre size. However, it also moves the centre of the wheels forwards, reducing the neutral (unloaded) nose weight to almost zero. These units cost � (mid 2011 prices) including the mounting plates. One end of the modified axle. A 100mm length of 50mm by 50mm mild steel angle has been welded across the end of the box section. The mounting plate overlaps the end of the box section and an additional fillet adds strength where the mounting plate will tend to pull away from the axle under high imposed loads on the road. The original welding on the axle would no doubt have been undertaken using an automated argon-arc or similar machine to give a very good quality weld. The new welds were done (as is usual in small workshops) using cheaper carbon dioxide shielding gas. The new mounting plates mounted parallel and exactly aligned on the axle. Careful measurement is needed to obtain the correct tyre sidewall to chassis clearances with the chosen type of wheel and tyre. Locating these plates in exactly the correct position is the most critical part of the whole operation. Close up of one of the new mounting plates - these are supplied as a standard item with the new suspension units. The written instruction 'press' is to ensure the plate was pressed close to the axle before being welded! Slight distortion would otherwise have resulted in a small gap. Top view of the new suspension mounting plates and the welds connecting it to the axle. The modified axle back in place on the trailer, ready to have the new suspension units installed. The welding cost � at a small local workshop. Covered in a little grease and oil, the new mounting plates should last 100 years. The completed new suspension with units bolted to the new mounting plates. High tensile 8mm bolts and nuts (either 8.8 or 10.9 grade) must be used. The drop arms must always face backwards - to give a 'trailing' suspension. The completed trailer with second-hand 155/ 70 x 13" Mk 3 Ford Fiesta wheels and tyres. The mudguards have been moved forwards because the drop arms on the new suspension units are shorter than on the original units. This moves the centre of the wheels forwards from their original position. The centre of gravity of the trailer was also moved forwards, giving less nose weight when unladen. Locating a spare wheel at the front of the trailer is one way to remedy this. The original mudguards were still an adequate size for 13" wheels despite being designed for 10" wheels. There was little difference in the OVERALL diameter of the old and new wheels and tyres - 510mm compared with 550mm. The overall cost of replacing the suspension and wheels was around �0 - plus of course many hours work! The more usual fate of hundreds of small trailers is either they are repaired to an appalling and dangerous standard and then sold, or they are scrapped. This is variously dangerous and/or wasteful - and all because of poor design. Spring is here and hedges need to be clipped - and before birds start to nest. A trailer can come in very handy. The spare wheel bolted to the front panel corrected the nose-weight problem that resulted from the replacement wheels being slightly further forward. The law requires that trailer wheels and tyres meet the same standards as for cars. 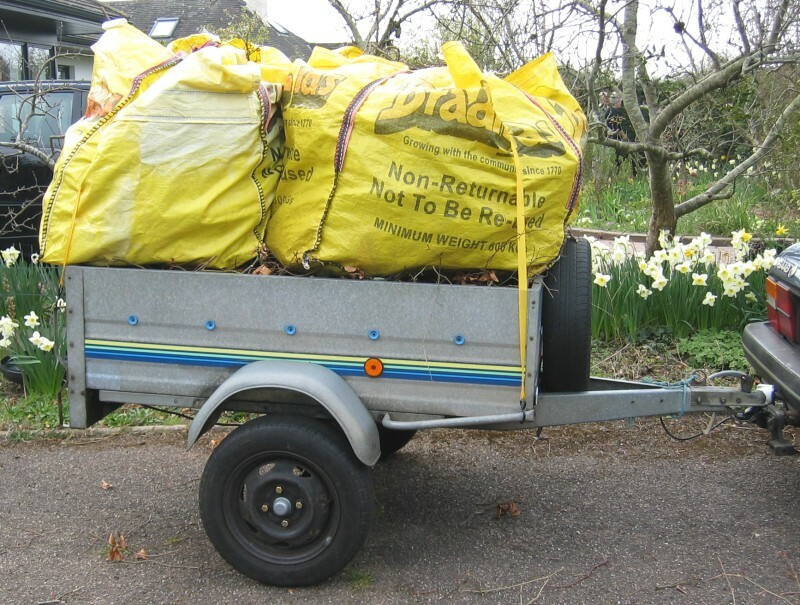 Because of the low loading when transporting garden refuse, tyre pressures can be as low as 20psi. As with caravans, it is advisable to check the tightness of wheel studs regularly. The 'hard' rubber suspension can cause studs to work loose. This is never a problem with cars, all of which have soft and well damped suspension systems. Caravans fitted with alloy wheels are notoriously prone to wheel studs coming loose - maybe because alloy wheels should never be used with 'hard' suspension systems? This is apparently because alloy wheels have no 'give' in them when they are bolted up, whereas steel wheels can be designed to deflect, thus in effect making the whole wheel into a giant spring washer. It is probably advisable never to use alloy wheels on a trailer. This type of journey is not recommended using a trailer whose suspension is about to collapse!